The University of Dayton?s Marian Library, which holds the world's largest and most comprehensive collection of printed materials on the Virgin Mary, is the winner of the Catholic Library Association?s 2016 Aggiornamento Award. 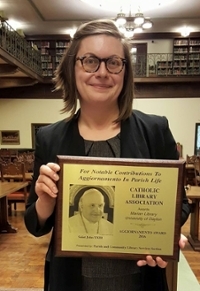 Sarah Cahalan, the library’s new director, accepted the award — given for “an outstanding contribution made by an individual or an organization for the renewal of parish and community life” in the spirit of Saint John XXIII — at the association’s annual meeting in San Diego. It has more than 100,000 books and pamphlets in about 50 languages, including some of the earliest items printed in the Americas and publications documenting the appearance of Mary to Saint Juan Diego at Guadalupe, Mexico. The archival collections include thousands of holy cards, postcards, Christmas cards, as well as stamps, medals, rosaries, papers associated with Marian movements, and a significant number of photographs. With the International Marian Research Institute, the Marian Library displays Nativities from around the world every Christmas season. The library and institute, located on the seventh floor of Roesch Library, also maintain the website, “All About Mary,” to put centuries of information on the Virgin Mary at anyone’s fingertips. The Marian Library is open 8:30 a.m. to 4:30 p.m. Monday to Friday. More information is available online.